Managing the methane contained in coal seams is important for mining companies to maintain operational safety, as a potential source of energy and to minimise greenhouse gas emissions. This case study outlines how a mining company examined options for dealing with the gas associated with mining coal, including capturing the methane and using it as an energy source. 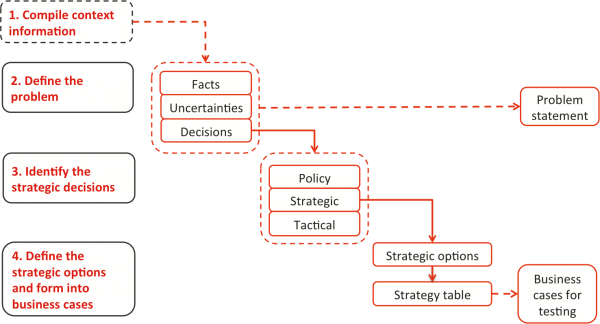 The case illustrates a structured process for collecting and classifying information, and using it to identify the components of decisions and develop options for subsequent evaluation. Safety and effects on operations: methane mixed with air is highly flammable, and explosive in the right concentrations. Managing methane is critical to safe underground coal mining operations. Potential source of energy: coal mining and coal processing operations are energy-intensive. If methane can be used as a source of energy, it can contribute to reduced operating costs and an increase in the security of energy supply. Greenhouse gas emissions: methane is a potent greenhouse gas, with a global warming potential calculated by the US Environmental Protection Agency that is 28 to 36 times that of carbon dioxide. Emissions would be expensive for coal miners if there were a cost on carbon, as well as contrary to the sustainability targets of many of them. This case study outlines how a mining company examined options for dealing with the gas associated with mining coal, including capturing the methane and using it as an energy source. It rationalised the wide range of possible options into a smaller and more manageable set for rigorous business and financial analysis, including risk assessment. Context information, Step 1, was compiled first and provided as briefing material for participants in a workshop process that covered Steps 2, 3 and 4. Steps 5 and 6 were conducted later and are not discussed in detail here. The company operates underground coal mines at several sites. It is acutely aware of the importance of the gas that is associated with the coal it produces. Generating revenue and creating carbon credits by using waste mine gas for local electrical generation may make economic sense. However, the company does not want matters associated with gas to distract it from its core business of mining. When considering gas emissions associated with mining, the company is seeking a strategic approach that contributes to long-term growth and value creation, generates an appropriate return on capital, and enhances the profitability and sustainability of the business. The relevant objectives for the company are summarised in Table 1. Gas can be collected before mining starts (pre-drainage), during mining operations from the ventilation system, and after mining has been completed from residual underground voids (called the goaf). Some options are summarised in Table 2. Variability and reliability of supply: most gas use options need a reliable and consistent supply of fuel to be viable, but mining activities are subject to unplanned interruptions so secondary fuel supplies may be needed. Information was compiled about the company’s current and planned operations, the stakeholders that might have an interest in or an influence over the options it considered, and a set of specific technical topics listed in Table 4. There were many pages of information about each of these topics; only a small selection of the technical matters are summarised here. The workshop reviewed the context material summarised in the section above, covering Steps 1 and 2 in Figure 1. The key element structure in Table 4 was used as the basis for brainstorming issues. Issues and ideas were written on Post-it notes™ and displayed on a wall. Issues and ideas were combined and grouped, in the process indicated in Figure 2. Decisions are choices that can be controlled, are measured by value-based decision criteria and have objectives related to a desired level of performance. The company needs to decide how to protect its current operations and its planned growth from future electricity price rises and shortages and interruptions in supply. There will not be sufficient base load generation to support growth plans, and the company can expect a substantial increase in energy costs in the next few years. Strategic decisions, the focus of this exercise, affect the scope, timing and value of the opportunity. Some of the key areas in which strategic decisions were required are noted in Table 5. Should the company generate and supply electricity using both coal and methane, or restrict the strategic focus to gas alone? Should the company generate electricity itself from gas, sell the gas or enter a joint venture? Should the company only generate for its own needs, or trade on the wider electricity market? Should the company focus on local site-specific opportunities or take a broader regional focus? Should the company continue to flare or vent gas, given community and regulatory responses? Should gas drainage be treated as core business to be retained in house, or could it be outsourced? Should the company act now, or wait for more clarity about carbon pricing, electricity supply and new technology? What are the options for dealing with future energy shortages? How should the company’s gas resources be valued? How should investments with non-quantifiable benefits, such as improving environmental performance and community perceptions of the company, be evaluated? Strategic options were developed, based on gas collection (Table 2), gas use (Table 3) and commercial options, and the questions in Table 5. The advantages and disadvantages of each option were likely to vary from site to site, and the company could adopt a portfolio of approaches across its operations. In practice, several pages of detailed description and explanation accompanied each option, with links as appropriate to the context information. 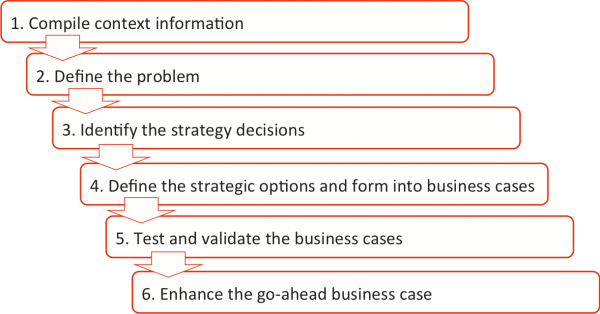 Combinations of options were aggregated into a strategy table of example business cases. The table did not include every combination of technical and commercial options – the aim was to develop a range of representative business cases for high-level filtering, with additional detail included as necessary during evaluation and testing in Steps 5 and 6. Table 6 summarises three of the cases, labelled ‘clean’, ‘green’ and ‘dirty’. Some of the options in the left-hand column of Table 6, plus the company’s objectives, were used to generate evaluation criteria for the set of business cases. Some financial criteria were readily quantifiable, but many others were ranked initially on ordinal preference scales. The evaluations provided the basis for informed judgements about preferred options and the best way forward for the company. From these the company was able to develop a broad strategy that could be applied at a number of mine sites for waste gas management and power supply security, to feed into broader planning and prefeasibility analysis of major investments. There are often many complex and interlinked factors that have to be understood and rationalized when complex investment decisions must be made. It can be difficult to know how to identify concrete options and select the best of them. The filter of facts, uncertainties and decisions, followed by the identification of policy, strategic and tactical matters, allows the information to be simplified and structured, producing discrete business cases that can be evaluated on their own merit. Often, the go-head case will be a composite of two or more of the cases studied. In this case, matters associated with energy and energy security were best considered in conjunction with options for dealing with waste gas from mining. These areas could have been addressed independently, or in sequence, but core inter-relationships would have been lost and the outcomes would have been significantly sub-optimal. In addition, most strategic decisions involve matters about which a lot is known. Often the information available, or collected to support the decisions, is technical and specific. Pre-screening is important, to remove some of the detail that may not all be needed at strategic level because, while it is important for other reasons, it does not affect the decisions being made. Step 1, Compile context information, is critical for this, complemented by the grouping in Step 2, Define the problem. The ‘uncertainties’ generated in Step 2 of the process can also be the subject of further, detailed study to ensure that the eventual go-ahead business case is as robust as possible. The structured process used here facilitated the development of a clear company strategy. It does this by enabling complex, multifaceted decisions to be rationalised into a small number of discrete business cases, which can then be tested, evaluated and compared.